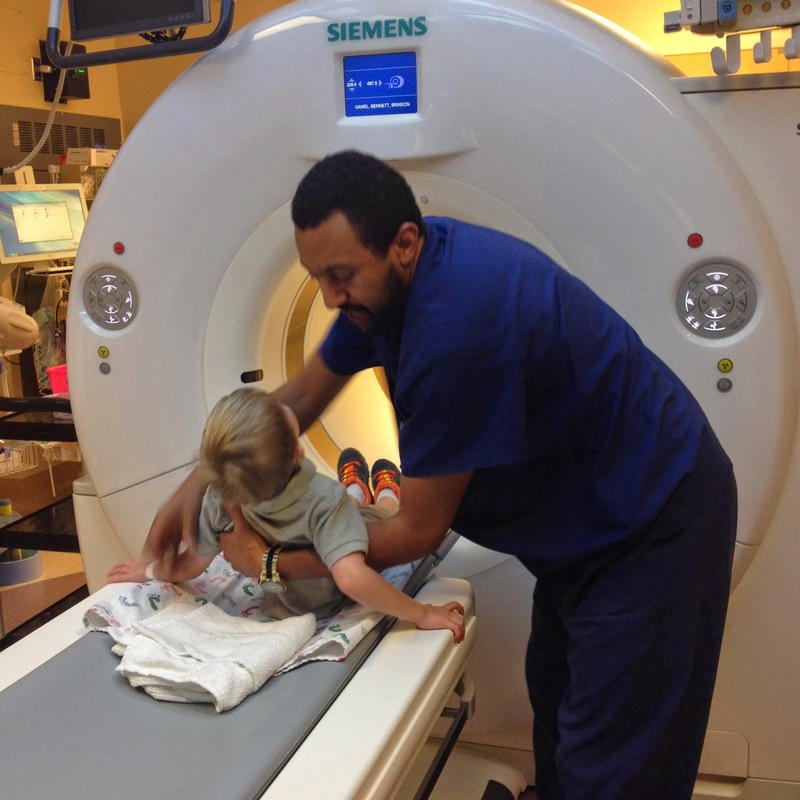 Bennett did great handling his first CT scan! He was able to do it while awake and didn't seem very afraid at all. It seemed to help to have his big brother there. 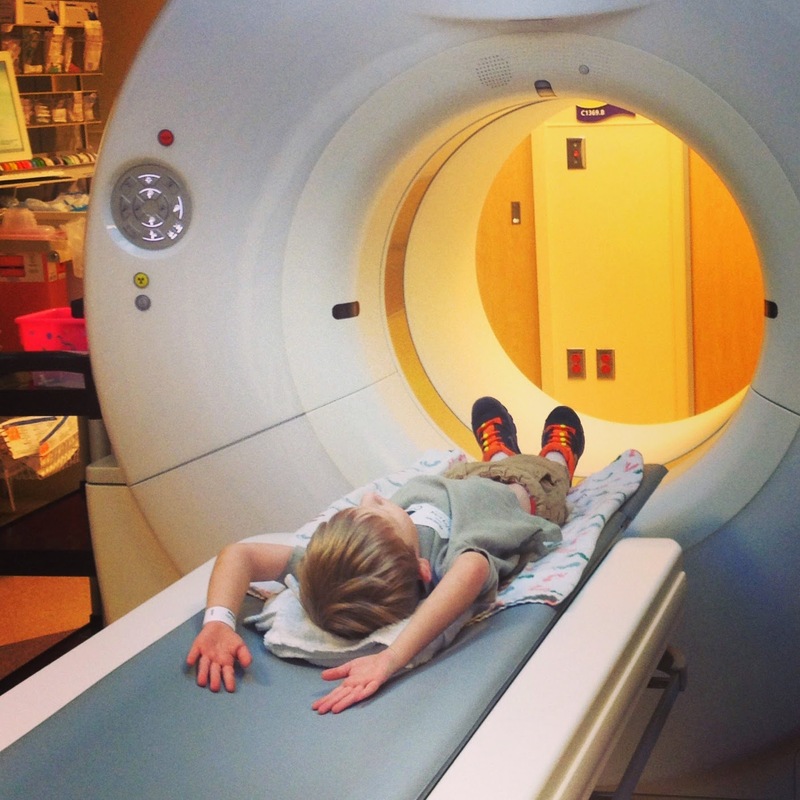 Oliver actually asked the technician if he could come along to tell Bennett everything he knew about what the CT scan was going to be like. He said, "see, Bennett, it's just a big donut camera and you are just going to go through the hole. And it's going to sound like a washing machine. And your job is to lay *very* still..." Oliver mainly repeated everything he had learned when we watched a really well done video on youtube for kids about getting a CT scan earlier in the day. But I do think it was helpful for both the boys to hear him tell it again. I have seen Oliver process his own fears by finding ways to guide and help Bennett not be scared. It didn't take but just minutes after walking in the room before the technician picked Bennett up and put him on the CT scan bed. While I was watching Bennett, Oliver briskly walked behind the glass and found two more technician friends who were observing the scan from the other room. 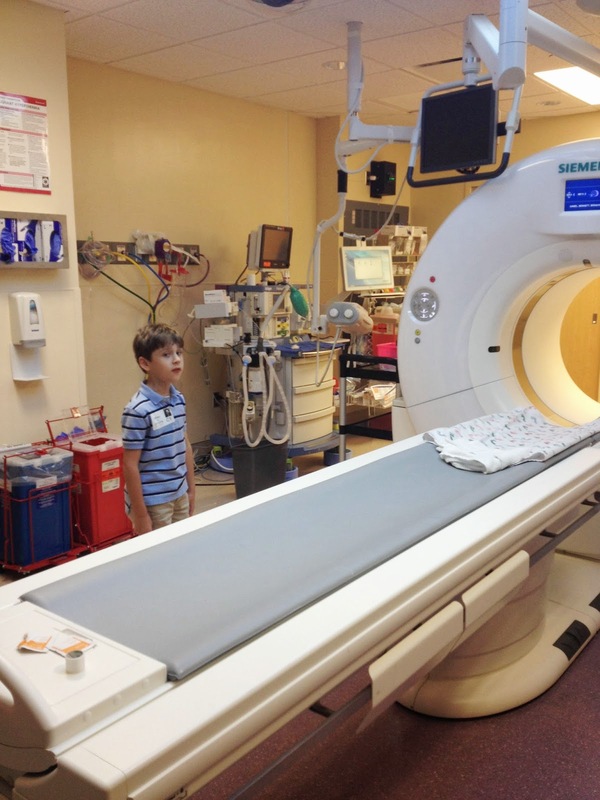 The techs taught him all about how to read a CT scan. The entire scan took no more than 5 minutes and we were done. The CT scan revealed good news and bad news! The good news is there is no sign of bronchectisis. Bronchectisis is what we call the scaring damage to the airways. It is what we are always most afraid of with Cystic Fibrosis. This is excellent news!! The longer Bennett goes without signs of bronchectisis, the better!! The bad news is Bennett's scan does show he has mild atalectisis/collapse of the right middle lobe of his lung, caused by mucus plugging of an area of Bennett's airway. What is crazy is that Bennett has no symptoms at all. He is never out of breath. He doesn't complain of his lungs hurting. And his last oximeter reading was 100%. This is what makes CF so scary: damage is happening on the inside, and yet, you would never know from the outside. The CF doc and I did talk at our last CF Clinic appointment about a spot on Bennett's most recent chest X-ray that may have indicate he had some "mucus plugging." It's hard for an untrained eye to tell what the arrow is pointing at, but, if you look closely, there is a long black spot tube-looking-thing on his lung that the doctor was worried about possibly being a clogged airway. We had agreed not to worry about it right now. But, I left his appointment knowing something might be going on that we would need to deal with later. The X-ray on the left is from October 2013. The X-ray on the right is from July 2014. Bennett's most recent Chest X-ray had looked better this year, than his did from last year. For reference, the big white spot on the left side of the lung is the heart. The white/grey cobweb looking things in the left picture demonstrate Bennett was dealing with some kind of infection in October 2013 (we think he was just dealing with a cold). However, there are still cobweb looking things on the right side of Bennett's lung in both pictures, indicating a problem still exists. This area is the same area that the CT scan eventually revealed is mildly collapsed. To be clear, Bennett doesn't have a collapsed lung, just a lobe is collapsing due to thick mucus, which is plugging the airway. But, if not eventually resolved, it will cause more severe issues. We have been advised to be more aggressive with our chest percussion therapy (our "Vest"). But, if we can't the mucus in that area to unplug, it may be necessary to use IV antibiotics or undergo a bronchoscopy at some point to get it unclogged. I have read that, unfortunately, once mucus plugs a part of the area, it causes that area to be more susceptible for mucus plugging in that same area later. So, I imagine we will have to keep our eye on that area from now on. 3.) how Cystic Fibrosis begins the cycle of damage - mucus plugs the airways, the infections come, the antibiotics fight the infections and then it just repeats. Sigh. That just made me feel sad all over again. I've been so absorned in the cancer world because of my niece's Neuroblastoma, that I only look at CF blogs if someone posts. And yours is the only blog on my reader at the moment. Man, so sorry about the plug. I pray things won't get worse any time soon, hey, I hope they don't get worse at all. My daughter had/has the exact same Right Middle Lobe Syndrome (atelectasis in right middle lobe). We noticed it on xrays for a couple of years before we finally did a CT. She did develop bronchiectasis in that area. Not trying to scare you, just make sure the doctors keep an eye on that area.